On my birthday I wore the first ever Bhujodi Sari. I bought it from Kalpavastram and even as I received the sari, and felt the material, I fell in love. The cotton handloom sari felt like heavy silk!! When I draped the sari, it felt so comfortable that I never wanted to stop wearing it. Bhujodi, a 500 years old village in kutch is the mother to this need-fully evolved craft, shouldered by 200 of its weavers today. The craft is said to have evolved as a need to cover against weather, at the time barter system was practiced as a method of exchange. ‘Rabaris’ being the original nomads and cattle rearers provided wool, milk products and grains to the village and ‘Vankars’ took up to weaving cloth. While rearing cattle pretty much remained the same, the Vankars with an indigenous technique in hand had breakthroughs one after the other. The neckpiece is fluorite beads and a khunn blouse to go with the sari. 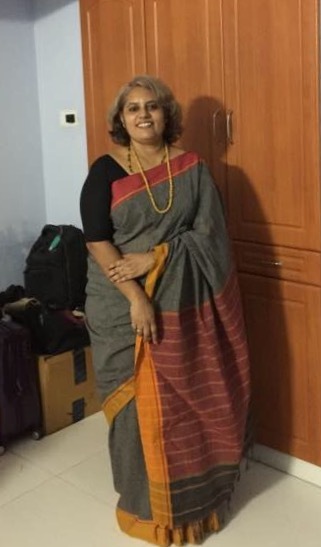 This picture has been taken after I spent the entire day wearing the sari and infact we walked in the afternoon in several places … in Chennai, the heat and humidity is just crazy and this sari carried me through all that. I bought the sari from Hemalatha directly. She has a Facebook page called “Punarjeevana”. This is a pure cotton sari and while the Bhujodi is soft cotton, this one is coarse cotton. It drapes like a dream. I wore one for dinner last evening with Usha and Rajini. Just didn’t feel like getting out of it. Here’s a picture of me in a Patteda Anchu sari. My love for handloom saris is renewed with these two distinct weaves. Every time I wear a handloom product, I know I am wearing something unique. The 120 different weaves that India has have evolved over the years with cotton and silk yarns of their respective areas. The variety is just mind boggling and the thrill of wearing something that is one of a kind is something else. The synthetic yarns and factory made clothes can never match up but I understand why they are needed. Lets keep buying some handloom so that the weavers can keep producing their artworks. Thanks a lot Stacy. I loved your blog and am following it. I also plan to buy your book. It seems like you enjoy all aspects of culture. The book’s deepest message is that culture is man made and that we need a higher set of values and beliefs to discern what is right and what is less so. I followed a culture because I thought it was so cool and gave up my own when I was young (actually not recognizing it was a culture with some very good values!) I was very caught up in everything Japanese which from the outside is very attractive and from the inside complex– both in good and bad ways. It took time to understand the truth of matters. I hope this topic suits you. Thank you for your willingness to read this story. I very much look forward to your thoughts as you have various deep experiences. Read all your posts on sarees. 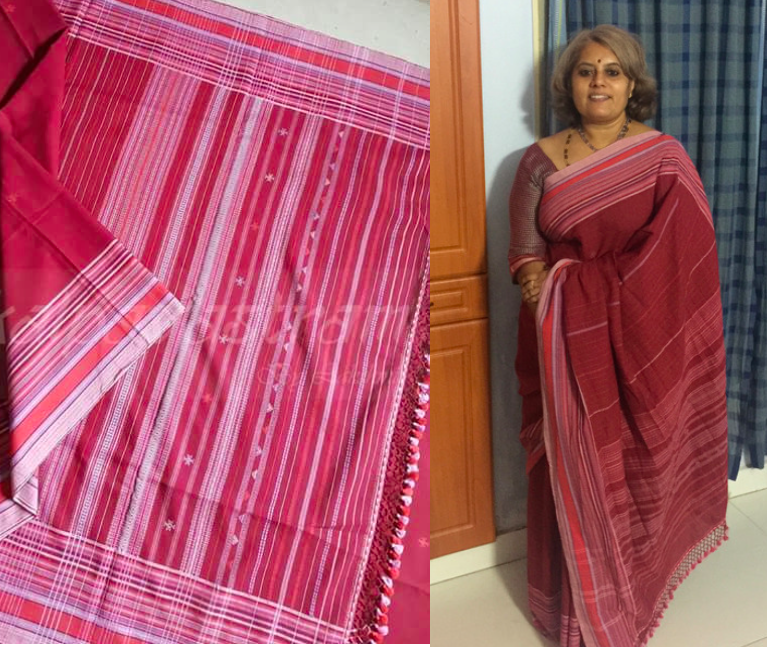 I have recently become very interested in handloom sarees and your posts are so informative. Got in touch with Punarjeevana and buying myself a pattada anchu to begin with!!! Thanks a lot for sharing your collections. Awesome ! Enjoy the sari. Its a wonderful drape.